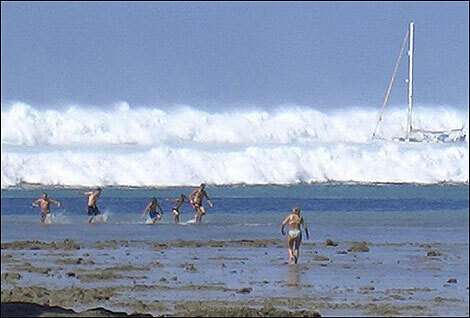 The hazards that originate from tsunamis have been recognised for some time. 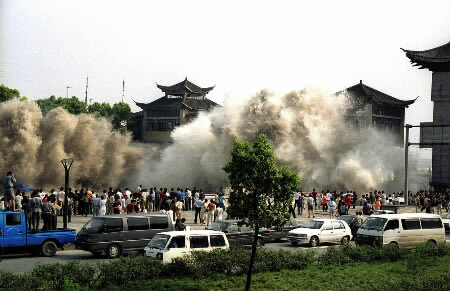 Newspaper reports about undersea earthquakes and movies about meteor-inflicted tsunamis have contributed to public awareness of the threat. Early warning systems were constructed and deployed for instance in the Pacific Rim. Many areas in the world, however, are not covered by such traditional warning systems. At the latest in December 2004, when a tsunami has devastated wide areas bordering to the Indian Ocean, the extensive media coverage has elevated the sheer possibility, the effects and the dangers of a tsunami into global public consciousness. In the memory and perception of tourists and holidaymakers seashore sites may forever bear tsunami-related dangers, resulting in the desire for effective, reliable and easy-to-use tsunami warning systems. Further Information about the frequency and occurrence of tsunamis. Our Tsunami Warning System contributes to alleviate this problem and has been filed for patent protection. The Tsunami Warning System has recently been introduced into the market and users can now subscribe. Subscribers to this alarm system will reliably receive a warning to their mobile telephones, as and when a dangerous tsunami is evoked. In this way the invention enables people to take preventive action many minutes before the devastating tsunami arrives. Beneficiaries of the tsunami warning system are people who live and travel near the seaside. Business Opportunity for Merchants - hotels, retailers, kiosks, magazines, tour operators, Internet portals, petrol stations, etc. can now sign-up as merchants for the Tsunami Alarm System. Advertsing materials are available online. The worldwide first Tsunami Warning System for everybody has been introduced to the public at Steigenberger Graf Zeppelin in Stuttgart/Germany in a press conference on 30. September 2005. With the Tsunami Warning System for everybody users will receive alarms onto their mobile phones - worldwide. Please note the wealth of press and TV inserts on the first Tsunami Warning System for everybody worldwide. The tsunami warning system is operated by an international consortium. The members are 3MFuture, A3M Inc. Victoria/Seychelles and Heindl Internet AG Tübingen/Germany. 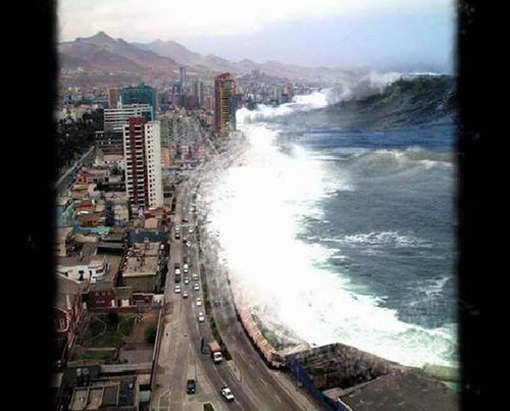 Although a tsunami does not look like in the picture below, it helps you to gain an idea about the destructive power of a tsunami. Without pre-warning it is too late. Spray at the horizon and retreated water indicate a forthcoming Tsunami. 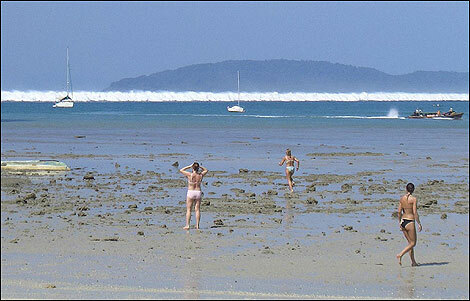 This photograph shows the 2004 Tsunami in Thailand. 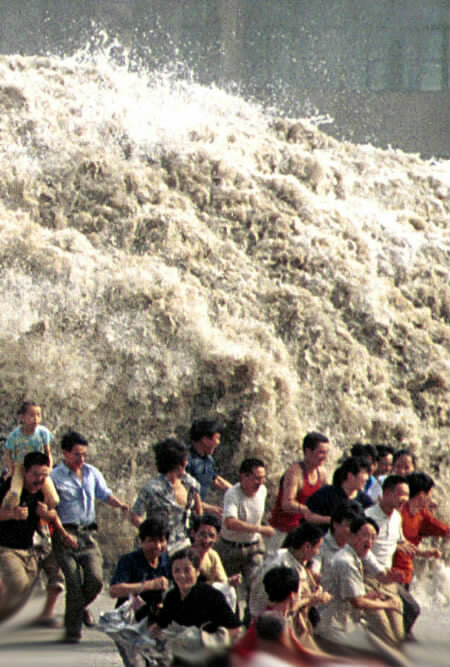 Instead of seeking shelter, the people are amazed about the coming waves. The people have realised that something is wrong. But it is too late now.